Tramontina pressure Cooker Solar Line. 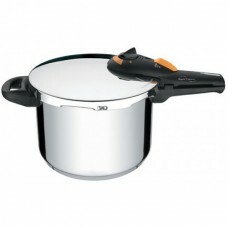 Pressure-cooking is a method that utilises steam pressure. By sealing food and liquids in the cooker, the temperature can be brought up to 118C. The steam pressure breaks downt he fibers in the food in a very short time. Food becomes moist and succulent with an intense combination of flavours. Because the foods are cooked under pressure, up to 50% mor vitamins and minerals are retained.